Last Friday, April 27 was a historic day in Minneapolis! The City Council unanimously approved a resolution that commits our city to achieve 100% renewable electricity: for municipal facilities and operations by 2022 and citywide by 2030. These goals serve as a strategy to meet the City’s aggressive greenhouse gas emission reduction and climate change goals by moving away from fossil fuels. The resolution responds to overwhelming scientific consensus that climate change is a real and existential threat to human civilization and is caused primarily by the combustion of fossil fuels. The City opposes the rollback of climate policy at the federal level and reaffirms its ongoing commitment to the goals of the Paris Climate Agreement. In addition to being the right thing to do for the planet, investing in renewable energy also allows us to keep more energy generation revenue in the city and create jobs for Minneapolis people of color who have been historically excluded from the old energy economy. Thank you to my colleagues and our staff that represent the City on the Clean Energy Partnership (where I serve as an alternate) - Mayor Jacob Frey, Council Member Cam Gordon, and Council Member Jeremy Schroeder - as well as the city's wonderful sustainability staff, the Sierra Club North Star Chapter, iMatter Minneapolis, and many others for their work to get this passed. This will take a lot of work to accomplish, but it is an essential step for our city. This has been a priority of mine since day one and I'm proud that we are taking this step! The City of Minneapolis wants to hear from you about the design for the Hennepin Downtown Street Reconstruction Project, which will include major street improvements for the corridor between Washington Avenue and 12th Street. People who live, work and travel along Hennepin Avenue are invited to comment on options for the overall aesthetic vision for the corridor between the Walker Art Center and the Mississippi River. An engagement process is underway in preparation for Minneapolis City Council review of the proposed roadway layout in July 2018. The reconstructed Hennepin will continue to accommodate many different travel modes, including wider sidewalk areas, one-way protected bikeways behind the curb, enhanced transit stops, and four vehicle lanes with Hennepin remaining a two-way street. This stretch of Hennepin, one of the city’s most celebrated cultural corridors, was last rebuilt in 1986 and the pavement needs to be replaced. Construction is scheduled to begin in 2019 and be completed by 2022. 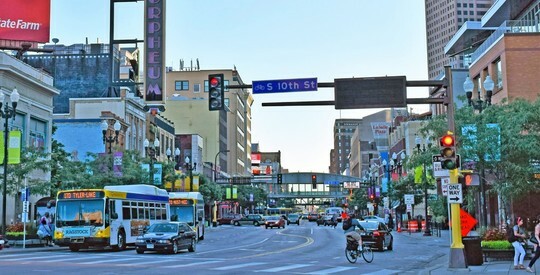 For more information about the project, visit www.hennepindowntown.com, email Hennepin.downtown@minneapolismn.gov or call 844-887-833. On April 27, the City Council also approved a pilot program to help encourage Minneapolis apartment owners to use a State provision that provides a 40 percent reduction in property taxes for having naturally occurring affordable housing (often referred to as NOAH). The "4d" pilot program adds incentives to properties that have not previously qualified. As a result of this pilot, owners of naturally occurring affordable housing can apply to the Minnesota Housing Finance Agency for low-income rent classification status, otherwise known as 4d status. This results in a 40 percent reduction in property taxes on the restricted units. To qualify, the property must receive financial assistance offered by the City and restrict at least 20 percent of the building’s units to be affordable to and occupied by households with incomes at or below 60 percent of the area median income. There is no singular solution to our affordable housing crisis, and we know that we are losing these NOAH units faster than we are building new ones, so we need to do everything we can to preserve their affordability whenever and wherever we can. 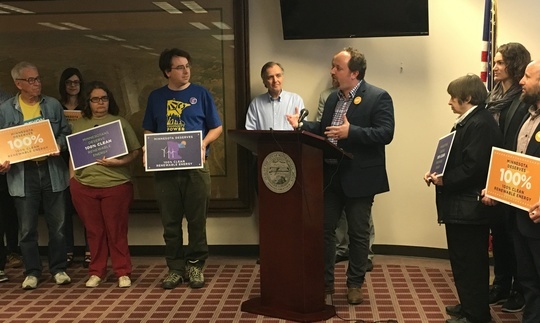 Council Member Lisa Goodman, Council Member Cam Gordon, and Mayor Jacob Frey all did great work to bring forward a solution that will make a positive difference. I was glad to be able to cast a vote for it. The City's Small Business Team works to help people start and grow small businesses in Minneapolis. They recently launched the Minneapolis Business Portal, which provides entrepreneurs and business owners with valuable information and resources to plan, launch, and grow a business. Farmers markets are opening for the season, and the City of Minneapolis now has an online interactive map that makes it easy to find farmers markets all over the city: www.minneapolismn.gov/farmersmarkets will show the address, season dates and opening times for each market. The map will be updated as information becomes available on 2018 schedules. The first market of the season – the Minneapolis Farmers Market on Lyndale Avenue North – opened April 21. The Thursday Nicollet Mall farmers market will return this year to Nicollet Mall in downtown Minneapolis. 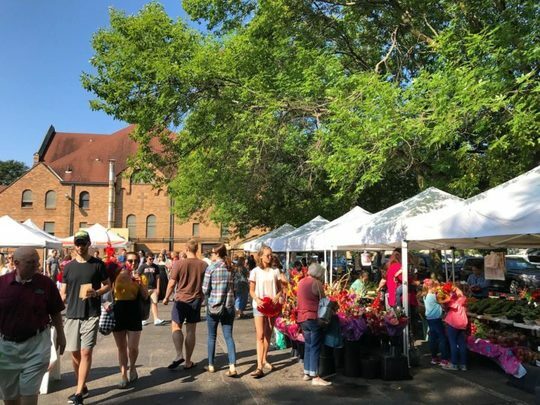 Other Ward 3 markets include the Mill City Farmers Market at 750 S 2nd St, which opens this weekend, and the Northeast Minneapolis Farmers Market at 629 2nd St NE, opening May 19. Nearly 30 farmers markets and mini markets will operate in Minneapolis this year. In 2016 they collectively represented more than $12 million in vendor sales with about 800 vendors. In 2017, market vendors supported approximately 5,000 employees and welcomed an estimated 1.2 million annual visitors to the markets in Minneapolis. The Clean City Minneapolis program, operated through the Minneapolis Public Works Division of Solid Waste and Recycling, offers multiple ways to get involved in keeping our city clean for all. Whether you’re working alone or as part of a group, it’s easy, and it all adds up to enhance our neighborhoods. 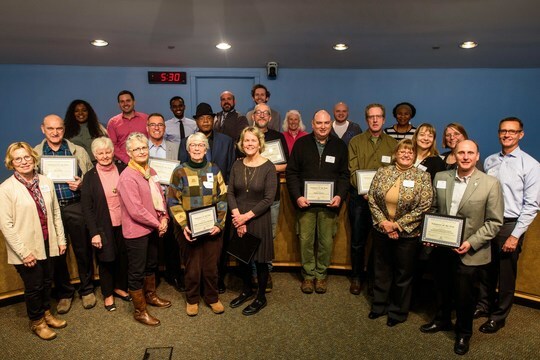 Congratulations Ward 3 resident Robert Buck on receiving the Minneapolis Park and Recreation Board’s Volunteer of the Year Award! “Robert Buck has been generously donating is time and expertise to the Forestry Department since 2013. A professional PhD. statistician by trade, Robert offered to assist with the scientific analysis of tree survival rates in Minneapolis. In collaboration with Park Board Forestry Staff and the University of Minnesota, Robert designed an ongoing study to track the establishment of newly plant trees over a five-year period. The study includes multiple steps throughout the year to facilitate ongoing quality control analysis. The work is extremely technical and includes pulling a survey sample set from the seasonal planting population, working to find and correct data discrepancies and sourcing additional data sets, writing an annual scientific report, and annually presenting the study results to the Forestry Department and Minneapolis Tree Advisory Commission. CenterPoint Energy Utility Work Along E. Hennepin Ave.
CenterPoint Energy began work on Monday, April 16 to replace natural gas mains and connect natural gas service lines to the installed mains in Minneapolis along E. Hennepin Ave. from Nicollet Island to 5th Street SE, and other nearby streets. This work is scheduled to end in early July, and it will be done in coordination with Hennepin County concrete rehabilitation work on E. Hennepin Ave., which will begin after July 4; and with the City’s paving project on 5th Street NE. Access on E. Hennepin Avenue will be maintained for the duration of the project, local businesses will have access to their properties at all times, and pedestrian traffic will be maintained. If the crews need to perform work on the weekends, they may need to place partial closures on the side streets. For more info on this project or to sign up for project updates from CenterPoint, visit their project web page. 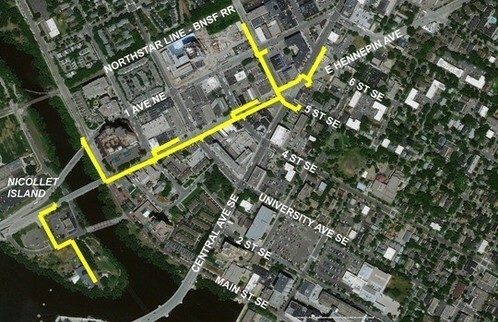 University Ave. NE Closure North of Lowry Ave. The Minnesota Department of Transportation is resurfacing University Avenue from Lowry Avenue to 44th Avenue in Columbia Heights. Work began on Monday, April 30th and the project should take less than two months. Please be aware that there will be construction noise in the area and some occasional work that will start before 7 a.m. and continue past 8 p.m. The recommended detour route is Central Avenue. Check this web page for more details. The Boom Island-Nicollet Island Bridge rehabilitation project is scheduled to begin on Monday, May 21, 2018. Work is expected to be complete by early September. During construction, the pedestrian and bicycle trail bridge connecting Boom Island/BF Nelson Park to Nicollet Island will be closed to all traffic. A pedestrian and bicycle detour will be posted for the duration of the project. The City of Minneapolis Heritage Preservation Commission granted a Certificate of Appropriateness to allow rehabilitation of and alterations to the existing Boom Island-Nicollet Island Bridge on April 17, 2018 and the Minneapolis Park and Recreation Board of Commissioners approved a construction contract on April 18, 2018. In late 2013, the bridge was closed to emergency and maintenance vehicles after an inspection discovered significant deterioration. Emergency repairs were completed in July 2015 to replace the bearings on the north abutment and modify the ends of the stringers. The bridge was then reopened to emergency and maintenance vehicle traffic. 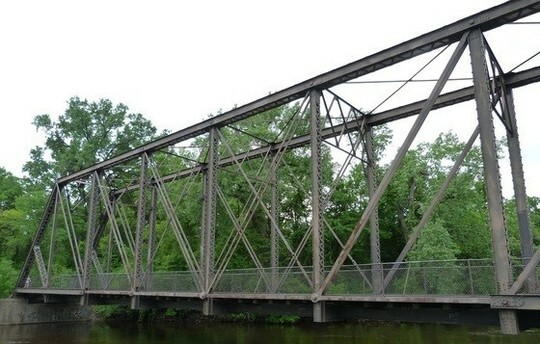 Please read the Discussion Item submitted to the Heritage Preservation Commission last spring for more information on the updated design of the bridge rehabilitation. We want to hear from you about the City's draft comprehensive plan! When finalized, Minneapolis 2040 will serve as a framework of interdependent policies, action steps, and maps intended to drive a citywide conversation about how the city will grow and change over the next two decades so all residents benefit. These open houses will have family-friendly activities and free food from local businesses. You can view and comment on draft policies and maps, or give us your feedback online at minneapolis2040.com. Public feedback on the draft plan is being collected until July 22. Join us for our next Good Morning Ward 3 on May 16 with special guest Joy Marsh Stephens from the City Coordinator’s Office Division of Race & Equity to discuss the City's past, present, and future efforts to address racial inequities in Minneapolis. Wednesday, May 16 from 7:30 - 9:00 a.m. This is a timely topic: racial justice leaders and historians joined members of the City Council’s Committee of the Whole for a first-ever meeting of the Race Equity Subcommittee on Wednesday, April 25. The subcommittee meeting, which took place during the Committee of the Whole meeting, had presentations on the history of racial harm, the current landscape of racial inequity and the future of racial justice within the city of Minneapolis. The subcommittee meeting also included an update on the City’s own enterprise-wide work toward race equity and the approval of appointments to the Racial Equity Community Advisory Committee. Council Member Fletcher will hold regular open community office hours at 5:00 p.m. on Wednesdays at a rotating neighborhood coffee shop in Ward 3 for constituents to drop by, get to know him, ask questions, and raise any issues you see in the community. All are welcome! RSVP on Facebook or just show up. If you want to discuss a specific issue or project, email laura.dorle@minneapolismn.gov and we'll add you to the agenda.